Very recent Usage Reports from seven different key market segments show amazing results that Transworld Systems is celebrating. No wonder, that this company is #1 in the Collections Industry with hardly any competition out there. When comparing apples with apples everyone else falls short. So take a look at these amazing reports which show how Transworld Systems services its clients day after day with unbelievable results. 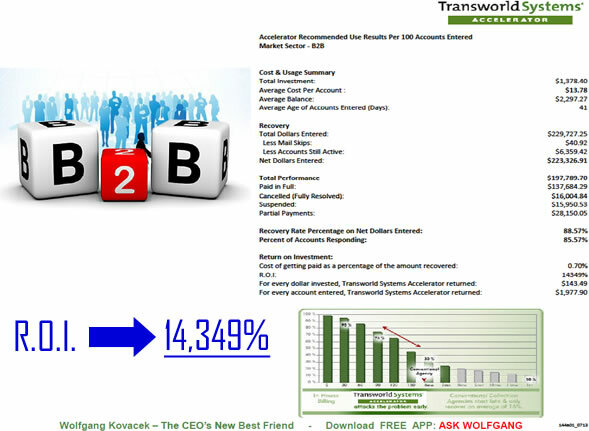 For any inquiries or questions how YOU can take advantage of Transworld Systems in your company, please ASK Wolfgang and connect with him.